Beer has been the most popular beverage in Germany for centuries. So the beer steins are an integral part of the German social life. ‘Beer stein’ is the name given to any beer drinking vessel now. But the name has originated from the word ‘stein’ meaning ‘stone’. So the original beer steins were stone ware. Before the stone ware was evolved in 1400s, the affluent class used silver or pewter tankards. The people of lesser financial status used earthen ware or wooden mugs. Both these beer-drinking vessels could not be used for long, as the earthen ware was easily breakable and the wooden mugs were highly unhygienic, due to the smell. By that time scientific temper was rapidly improving. So the furnaces with high temperatures were invented and used for firing the earthen ware. The material melted and combined to form a vitrified product. These were not porous but very strong. The hardness of the substance made it look and feel like stone and hence the name ‘stein’ came to be in use. Later, a pewter lid with a thumb lever was added to the steins, following the casualties of the great plague and the invasion of a kind of small flies all over Europe at that time. Soon molds were used to mass produce the beer steins and elaborate etchings and carvings were made on them by way of decorations. Allegorical as well as historical themes and scenes were carved on them. 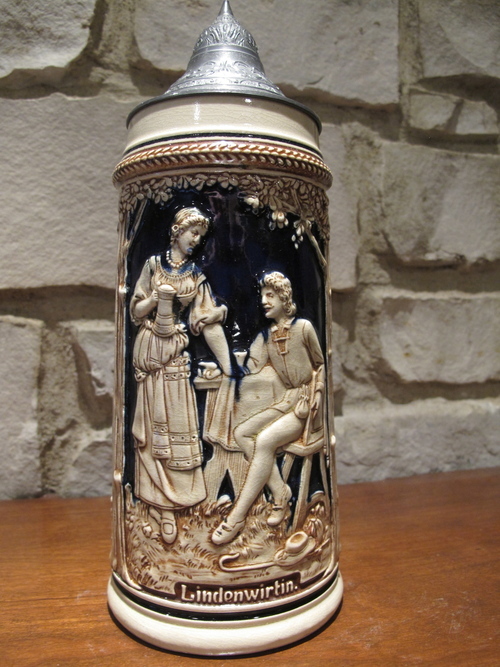 As the years went by, other substances like glass, pewter and porcelain were also used to produce beer steins. The great variety in the construction and appearance of the German beer steins soon gained the admiration of the world and they became very important as collectible articles and gift items as well as beer-drinking vessels. 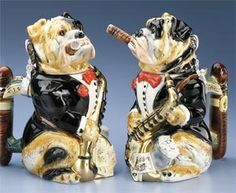 You can be sure of finding every category of beer steins at 1001beersteins.com. We deal in a wide range of categorized beer steins. Apart from the traditional beer steins, you can find exquisitely etched glass steins that will display the rich color of your beer. This makes beer drinking a superb experience to your taste buds as well as eyes. Our catalog contains items from the most sophisticated creations to very simple designs. You only have to choose the kind that satisfies your taste. 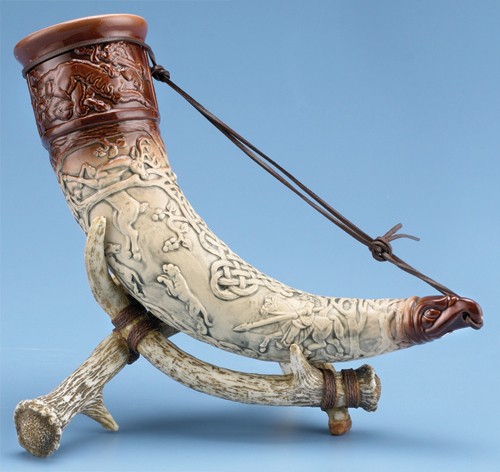 Our highly structured inventory contains traditional wares, glass beer steins, figural beer steins, beer horns etc. Our web site is constructed to facilitate an easy and productive browsing experience. You can browse by category, price or best seller items. You are sure to find the very items you are looking for without any hitch. On ordering our goods, you need not wait for long to get them. A fast delivery is our policy. Your interests and satisfaction means a lot to us. Our packing section consists of people with ample experience in packing fragile goods. So delivery of the goods in perfect condition is assured, by all means. But, just in case of damage, the article will be replaced, as soon as possible and free of cost.